CW3E collaborator Dr. Andrew Martin and co-authors have published a study investigating the impact of ice nucleating aerosol particles (INPs) on the clouds in a landfalling atmospheric river. The article is tilted “Contrasting Local and Long-Range Transported Warm Ice-Nucleating Particles During an Atmospheric River in Coastal California, USA” and is now available in the journal Atmospheric Chemistry and Physics at https://www.atmos-chem-phys.net/19/4193/2019/. This study used ground-based and remote sensing measurements deployed by the CalWater experiment (Ralph et al., 2016) and the CW3E mobile radiosonde system to study aerosol impacts on atmospheric rivers. A unique approach to use terrain blocking of the KDAX (Sacramento) weather service radar beam to constrain the temperature of hydrometeor class retrievals was also developed during this study. The first CalWater experiments (2009 – 2011) found that INPs could enhance atmospheric river precipitation by stimulating ice growth in orographic clouds (Creamean et al., 2013). However, gaps in knowledge about which type of INPs were most important and how they are injected into clouds remained. During this study, taking place during the second CalWater experiments (2015 – 2016), Dr. Martin and co-authors found that biological aerosols produced by local terrestrial ecosystems greatly enhanced cloud ice when meteorological mechanisms allowed for their injection to the storm. Specifically, kinematic structures, such as the coastal barrier jet allowing for boundary layer to cloud mixing, appear to be important. 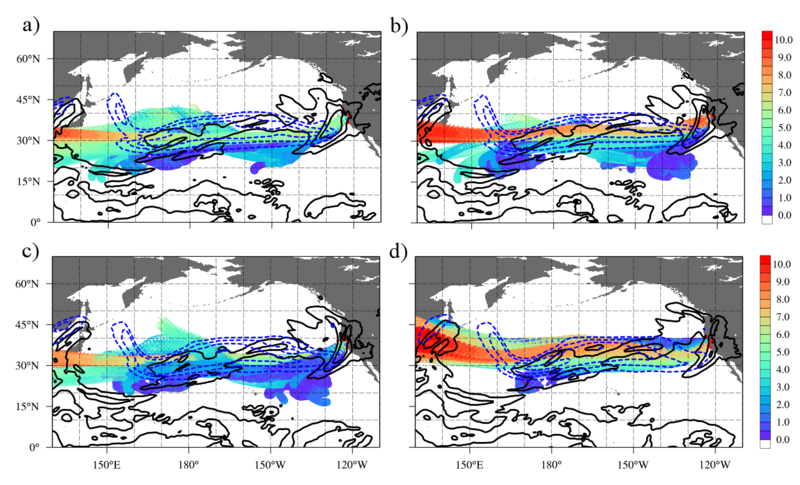 Figure 1 shows an example of airmass trajectory modeling, separated by dominant meteorological mechanism, that enabled this finding. The local terrestrial biological aerosols had greater impact on clouds than INPs transported from across the Pacific Ocean, lending additional insight to which INPs are important for stimulating cloud ice. Co-authors include Dr. F. Martin Ralph and Dr. Forest Cannon of CW3E. This study was funded by the National Science Foundation and performed in collaboration with Dr. Kim Prather’s aerosol research group (http://atofms.cloud.ucsd.edu/). Dr. Prather is the National Science Foundation Principal Investigator. The CW3E mobile radiosonde system was funded by the US Army Corps of Engineers, with Dr. Ralph serving as Principal Investigator. Figure 1: a) Back trajectory location and altitude (colorscale – km) during the early stages of the atmospheric river (before integrated vapor transport exceeded 500 kg m-1 s-1). Blue dashed lines show isotachs (m s-1, contoured every 10, beginning at 50) at pacific jet stream altitude. Black lines show integrated vapor transport (kg m-1 s-1, contoured every 250, beginning at 250). Back trajectory location was found using the FLEXPART model (https://www.flexpart.eu/) for thousands of individual elements released near cloud top over Cazadero, CA, one of the study measurement locations. b) as in a, except for the period when the barrier jet was present over the measurement location. c) as in a, except for when strongest atmospheric river conditions existed. d) as in a, except for the period after the cold front transited the measurement location. Martin, A.C., G. Cornwell, C.M. Beall, F. Cannon, S. Reilly, B. Schaap, D. Lucero, J. Creamean, F.M. Ralph, H.T. Mix, and K. Prather, 2019: Contrasting local and long-range-transported warm ice-nucleating particles during an atmospheric river in coastal California, USA. Atmospheric Chemistry and Physics, 19, 4193-4210, https://doi.org/10.5194/acp-19-4193-2019. Creamean, J.M., K.J. Suski, D. Rosenfeld, A. Cazorla, P.J. DeMott, R.C. Sullivan, A.B. White, F.M. Ralph, P. Minnis, J.M. Comstock, J.M. Tomlinson, and K.A. Prather, 2013: Dust and Biological Aerosols from the Sahara and Asia Influence Precipitation in the Western U.S., Science, 339, 1572-1578, doi:10.1126/science.1227279. Ralph, F.M., K.A. Prather, D. Cayan, J.R. Spackman, P. DeMott, M. Dettinger, C. Fairall, R. Leung, D. Rosenfeld, S. Rutledge, D. Waliser, A.B. White, J. Cordeira, A. Martin, J. Helly, and J. Intrieri, 2016: CalWater Field Studies Designed to Quantify the Roles of Atmospheric Rivers and Aerosols in Modulating U.S. West Coast Precipitation in a Changing Climate. Bulletin of the American Meteorological Society, 97, 1209-1228, https://doi.org/10.1175/BAMS-D-14-00043.1 .